The VegFest convention in Brighton is a celebration of all things Vegan. 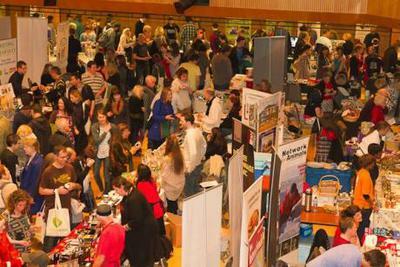 With over a 125 stalls selling goods from anything such as food, bodycare, and clothes to accessories and gifts, it is a place for vegetarians and vegans to get together and share the experiences of a healthy lifestyle. The 2013 show is a two-day event taking place on the 16th-17th March at the Hove Centre between 11am-6pm, and admission is completely free. There will be tons of entertainment including celebrity talks, demonstrations, cooking classes. free testers, live music performances, and cinema. Talks include animal right campaigns such as discussions on badger culling, a bid to save the whales, and the enforcement of the animal welfare legislation. There will also be an introduction to leading a plant-based lifestyle, with a guide to nutrition, foraging, and more. The speed dating event at 1pm on Saturday is a great way to meet people who share a similar lifestyle and hold values to your own. You can also watch the movie, Vegucated at 2pm, which is followed up by a discussion panel. Join stand-up comedians Andrew O'Neill and Sara Passcoe for an hour of comedy. At 4pm you can enter a vegan bodybuilding competition, to show that you don't have to eat meat to be a muscle-bound champ. There will also be brand new contest, the 'inverted row championship'. If you'd rather cook than crunch, then take part in one of cookery classes being held over the weekend. There will be adult and kids sessions. Children's classes will include a free comic for the first 80 to attend, and they will learn all about nutrition and how to make smoothies. VegFest isn't just about food; there will also be the opportunity to learn some Bollywood dance movies with Katie Holland, or get the kids to participate in a 'Sign & Song' music workshop. VegFest will return on the weekend of 24th-26th May in Bristol.